Without doubt, the best way to discover the Eyre Peninsula is to drive it, and enjoy the caravanning and camping lifestyle at its best! This special place in South Australia boasts some of the most stunning coastal landscapes you’ll ever see, and is often called ‘the seafood capital of Australia’. Heading west from Adelaide, you’ll pass Mount Remarkable National Park, which is a great place to experience the beauty of the Southern Flinders Ranges. Explore numerous bushwalks to enjoy the gorges and creeks, mountain range and summit. Quorn is a charming town to visit, with its historic streetscapes and the Pichi Richi Railway dating back to the 1800s. The historic tourist train travels through dramatic countryside from Quorn to Port Augusta and back, so take a ride and enjoy! 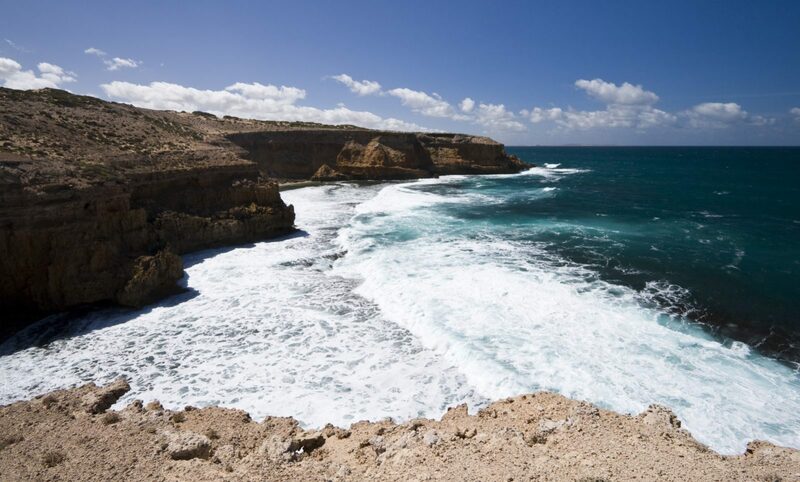 The Eyre Peninsula is all about seafood and stunning coastal views, and you’ll find plenty of both on the way to Port Lincoln. Stop for the renowned fresh oysters of Cowell, or take time for some fishing off one of the two jetties at Tumby Bay. Head to Winter Hill Lookout for great views across Boston Bay. Then, for the truly adventurous at heart, book a cage dive with great white sharks or view them from the safety of a glass aqua sub. Coffin Bay is right next door to Port Lincoln, but it’s worth spending some time in this area. Visit Coffin Bay National Park, where you can access Point Avoid, Almonta Beach, Golden Island and Yangie Bay on sealed roads, or experience great four-wheel driving to Gunyah Beach and down the Coffin Bay Peninsula. A 15-kilometre oyster walking trail meanders along the foreshore, ducking between the holiday shacks and homes, up to the lookout and through to Old Oyster Town. You’ll get to enjoy Coffin Bay’s abundant flora and fauna, plus magnificent water views.